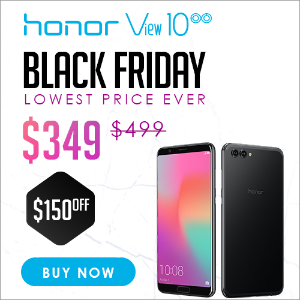 Amazon.com offers Honor View10 and Honor 7X Sales, View10 for $349, 7X for $169. The phone comes with a 5.99-inch touchscreen display with a resolution of 1080 pixels by 2160 pixels at a PPI of 403 pixels per inch. The Huawei Honor View10 is powered by 1.8GHz octa-core Huawei HiSilicon Kirin 970 processor and it comes with 6GB of RAM. The phone packs 128GB of internal storage that can be expanded up to 256GB via a microSD card. As far as the cameras are concerned, the Huawei Honor View10 packs a 16-megapixel primary camera on the rear and a 13-megapixel front shooter for selfies. The Huawei Honor View10 runs Android 8.0 and is powered by a 3750mAh non removable battery. It measures 157.00 x 74.98 x 6.97 (height x width x thickness) and weigh 172.00 grams. The Huawei Honor View10 is a dual SIM (GSM and GSM) smartphone that accepts Nano-SIM and Nano-SIM. Connectivity options include Wi-Fi, GPS, Bluetooth, NFC, Infrared, USB OTG, 3G and 4G (with support for Band 40 used by some LTE networks in India). Sensors on the phone include Compass Magnetometer, Proximity sensor, Accelerometer, Ambient light sensor and Gyroscope. With the Honor 7X L24 32GB Smartphone, you get an edge-to-edge 5.93" display with an FHD+ 2160 x 1080 resolution for immersive visuals in supported videos and games. Speaking of gaming, gamers will enjoy the cinematic 18:9 aspect ratio, which gives more real estate for you to see. Get the upper hand in multiplayer or just enjoy a larger display when going solo. The dual 16MP and 2MP rear cameras are designed to quickly capture stunning photos thanks to PDAF technology, which focuses the camera quickly, so you have a better chance of not missing a memory that will last a lifetime. Portrait Mode is designed to provide the optimal settings for professional-level results.